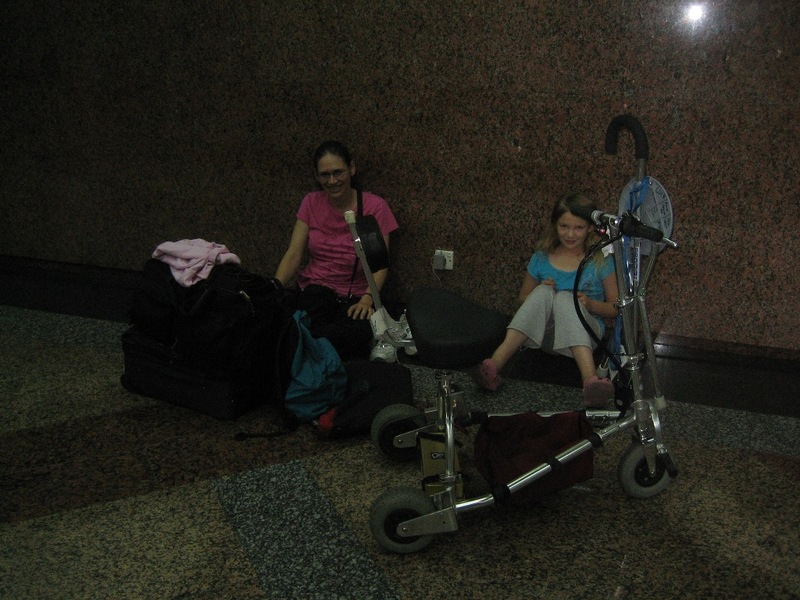 My daughter and I traveled in Malaysia for two weeks this summer before my husband joined us for another four. She loves for me to bring the scoot along because it lets us go much further and longer than my legs will (I've damaged my Achilles tendons) and can even carry her if she gets tired. In exchange, she helps me carry it up and down stairs, curbs, etc. and onto buses, trains, skyways, etc. since MY is rarely made accessible. You should have seen the expression on cab drivers' faces when they went from thinking the scooter might mean a van taxi at a higher fare and instead I folded the scoot and handed it to the driver of an economy cab with one hand or my 8 y/o picked it up and gave it to them! Sometimes it saved us using cabs altogether since we could easily and quickly scoot a mile or so between sights. Also, on this trip, I finally got bold and started taking it up and down escalator which turned out to be very easy as long as we didn't have luggage. Occasionally I had to get a man to help us move all our suitcases plus the scoot up flights of stairs. Although I was always nervous, both Singapore Air or Air Asia allowed the LiIon battery (I contacted them in advance) though Singapore Air temporarily lost the scoot on the way there when it missed our connection and detached the battery and sent it down the baggage chute "naked" on the way back (it was OK)! Anyway, we had a great time and the scoot let us go to places like big amusement parks that would have been impossible for me with my seat cane. People were curious about it. They assumed, I think, that we just used it for conveience and wanted to know how much it cost, as response I've never gotten in the US. I usually told them why I use it and they seemed surprised. I guess everyone else just assumed it was another travel gadget!